Some things are packed. Some are worn. As a solo traveler, I feel it is important to pack light. For this, I have the ultimate one bag packing list for your carry-on. Face fewer lineups at airports, both at check-in and when you get off the plane. Smile and walk by all those people watching the bags that are not theirs go round in circles on the carousel. Are more mobile so that walking a few blocks is not a problem and you don't have to look for an elevator rather than use stairs or an escalator. Can save money by taking buses rather than taxis. Are less of a target than someone who has a large suitcase or multiple bags. Clearly, they must have a lot of great stuff to steal. Won't lose luggage in transit meaning you won't be shopping at your destination rather than exploring. Won't need to spend time completing airline forms detailing your lost luggage. Don't have as much to lose when repacking. Won't be carrying things that you never use. Won't pay extra for bags on budget flights. Won't pay extra for a porter to bring all your bags to your room. To me, packing light just makes sense. But it seems that it is a challenge for many. As I travel to conferences other delegates wonder at my ability to put it all in one carry-on and a day pack. One year I went to Los Angeles for four days (it was hot), then to London for four days (it was cool and damp), on to Wales for a lot of walking, then north to Liverpool and Edinburgh. I traveled for 19 days in total and the first eight I was at conferences. Needless to say, the weather and activities between LA and Edinburgh were very different. But I had everything I needed in one carry-on and a day pack. Packing light, in just a carry-on suitcase, can take a lot of thought--but it can be done. All your travel paperwork. I have all my travel information in Dropbox but I take paper copies with me as well. Hotel confirmations. According to an analysis by Frommers, "Booking.com remains the top direct booking site. It smokes all competition..."
Passport and visas as necessary. Travel insurance. I'm proof that travel insurance is essential. I like World Nomads but see for yourself. Read Going Alone? Travel Insurance is a Must. You can also go directly to World Nomads. Cash. It's always good to have some cash with you. No-foreign-transaction-fee credit card. If you're outside your home country this will save you 2-4% on everything you put on your card compared to the typical credit card. When I travel outside Canada I prefer to use a card with no foreign transaction fees. Until recently that was the Amazon.ca Visa Card however it has been cancelled. The only no-fee, no foreign transaction fee, Canadian card I know of is the Home Trust Visa card. Understandably, there is currently a high demand for this card. I'm still waiting for mine. In the US, Chase is known for their no foreign transaction fee cards but check with your own financial institution. Backup card with no annual fee. I have a basic free Visa card that is a backup to my backup. And yes, I have had to use it. Roadside assistance. If you have AAA or CAA you’re fine in North America. If you don’t, you can buy short or long-term roadside assistance from Allstate. VPN I have a VPN on my phone, tablet, and computer so that I can safely use public Wi-Fi. I would never travel without it. I think it so important that I contacted the company I use, StrongVPN and asked for a discount for readers. And they gave it to me! Enter Solotraveler as your coupon code at check out. For more details read VPN for Travel: What, Why, and an Easy Setup Guide. To go directly to set up your VPN click here. Global plugin adapter with USB ports. Camera and charger - To be honest, as of my last trip, I'm cutting this from my personal list. Phone images are getting so good that I hardly ever pull out my DSLR. I'm switching this for my Go-Pro which I find convenient and used a lot on that trip. Go-Pro. I love this tiny, little video camera and they've become so affordable. Computer and ac adapter if you're so inclined. Here's how to think about clothes if you want to pack light. To be pack-worthy, everything must go with many things. Nothing can have a one-time, one-purpose use. To have clothes for a range of activities that work together, choose one color palette. Working with a base color like black or brown, along with a contrasting color such as gray or beige plus an accent color makes sure that everything you're carrying works together. Shoes make the outfit but they can also break a trip. Take shoes that have proven themselves comfortable. Shoes – two pairs total. One pair of street shoes and one pair of dressier shoes plus a pair of light flip-flops if you're staying in a hostel. I take low-cut boots for most seasons but sandals if it's summer. If you need hiking boots, wear them on the plane. You can tie them onto your carry-on or backpack and wear your street shoes at your destination. 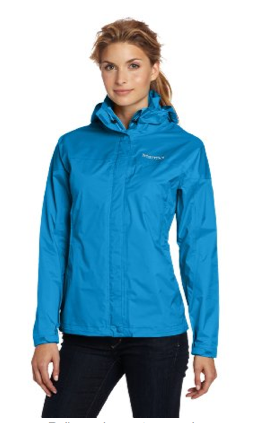 Jacket - I have my second Marmot Women’s Precip Jacket. It took me over 12 years to wear out my first one. It sounds like a lot but it’s not. Rinse clothes out when necessary. Count what you didn’t use when you get back and don’t pack it again. 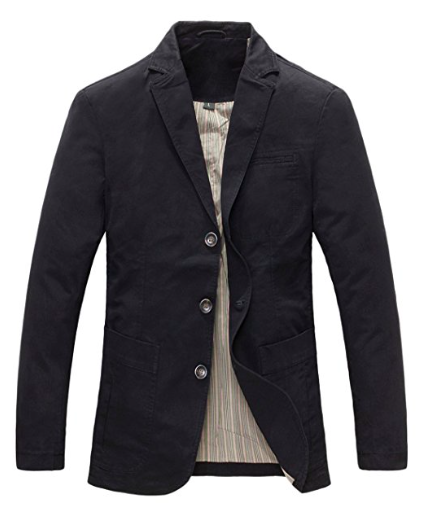 A casual blazer something like gives guys a lot of fashion flexibility. A man's packing list is not a lot different from a woman's except that it's easier. There is not as much nuance in a man's wardrobe and, throw a blazer onto a guy wearing jeans and a t-shirt, and he looks great. So, here's the men's packing list. Shoes - two pairs total. One pair street shoes (or sandals) and one pair of dressier shoes. 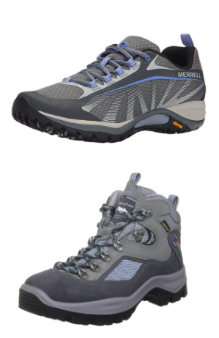 If you need hiking boots, wear them on the plane and only bring shoes that have proven themselves comfortable. Pants/shorts - three pairs total. You know your style but one pair should be long and not denim. 4 t-shirts (make sure at least one of them is white to wear under a dress shirt). If you're going someplace tropical or humid, make sure that they are very light and pack more of them. Rinse clothes out when necessary. Count what you didn’t use when you get back and don’t pack it again. Don’t pack the bulky things - wear them on the plane. Follow carry-on rules according to your airline. Be really careful about the weight. Just because you can fit it into a carry-on does not mean they will let you on the plane with it. Watch the restrictions on the size of bottle liquids and other items you are allowed to carry on board. Be considerate of other passengers and don't hog the overhead space. I only own the two bags shown on this page. I have a carry-on size backpack by Vaude (my model is no longer available but you can find the current Vaude packpacks here) and a very affordable roller bag by Swiss Gear (that could be updated as it is now nine years old but hey, it's still going strong). I also have a daypack that is made for a hydration system, however, I don't use it for that. The interior sleeve that's for the bladder fits and protects my computer or iPad perfectly. 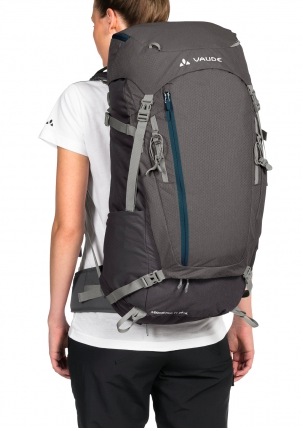 This pack is similar, but, as with the Vaude, not exactly the same as mine. Carry-ons work because, essentially, you don't need much more for a month than you do for a week. Are you getting ready to go? Let's start with footware because if my feet aren't happy, I'm not happy. 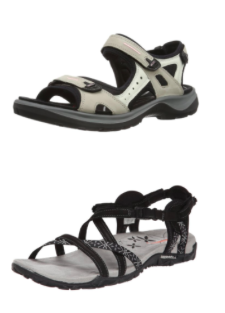 I loved my Merrell sandals (the bottom image) but since a knee injury it's all about my Eccos which offer more support. 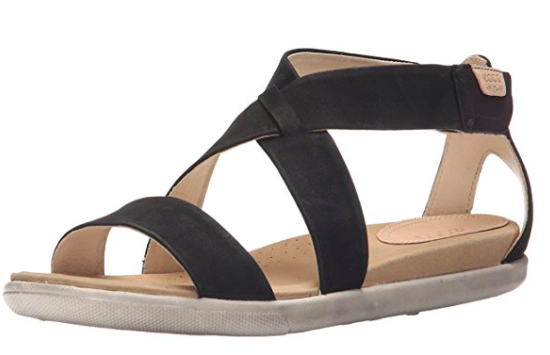 These Ecco sandals are dressier than mine and my sister-in-law, who has had two knees replaced, swears by them. 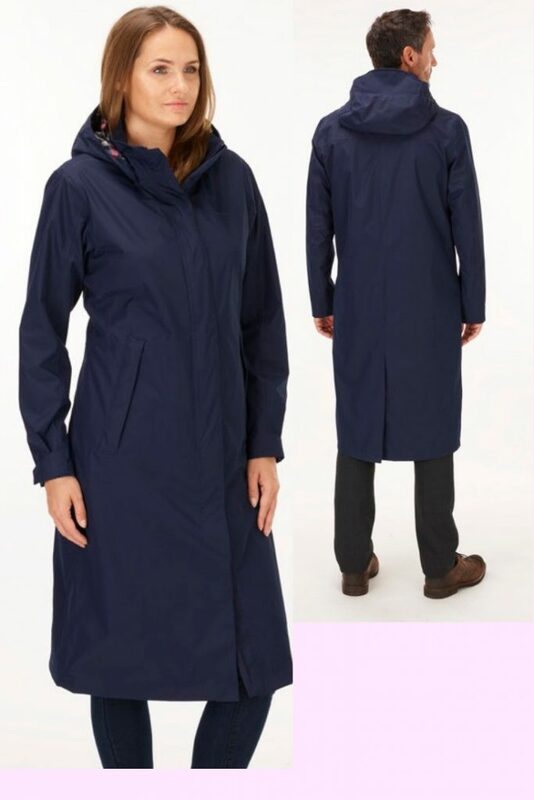 My husband has this coat and he loves it for casual and business occasions. It's really light and compact and also waterproof. It's made from the same high-spec Barricade™ technology that's used in specialist outdoor jackets. Get it from Rohan. I love this jacket. It is my second Marmot jacket. It took me 12 years to wear out my first one. 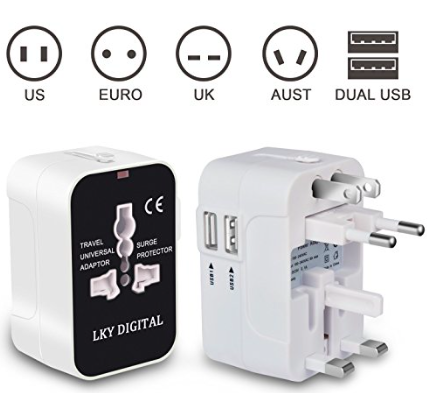 International adaptor with two USB ports. My sister has this dress so I can confirm the quality and how comfortable it is. Paired with heels it is quite dressy. It has a slit side pocket on the left and a zipped side pocket on the right. Roll it up and pack. 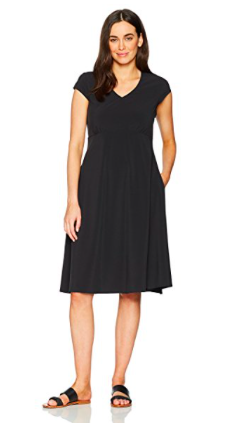 Exofficio has dresses in a variety of colors and styles. They also have great underwear, shirts, etc. for travel. 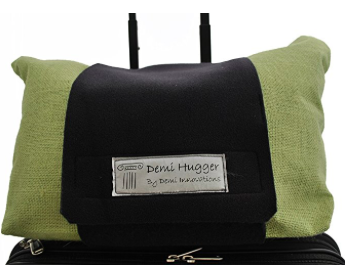 The Demi-Hugger attaches just about anything to your carryon making it easier to move through airports and the like. It was Tracey's favorite find of 2016. This is my bag. 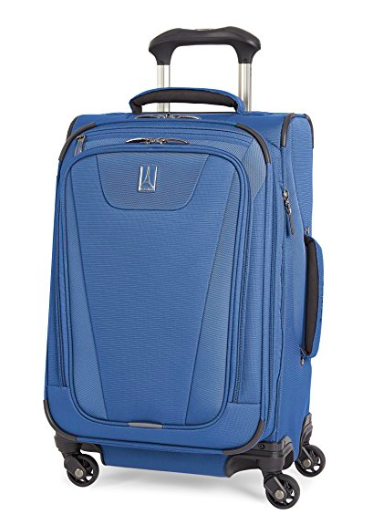 It's a TravelPro and certainly not the most expensive you can buy but the quality is good and it maxes out the carry-on dimensions. No space wasted! I love my Vaude , backpack that is designed for a woman. This is an updated version. It weights 3.27 pounds and has lots of functionality including access to the main compartment by a zip rather than the top.